Processed minced meat can be made into many tempting menu models. 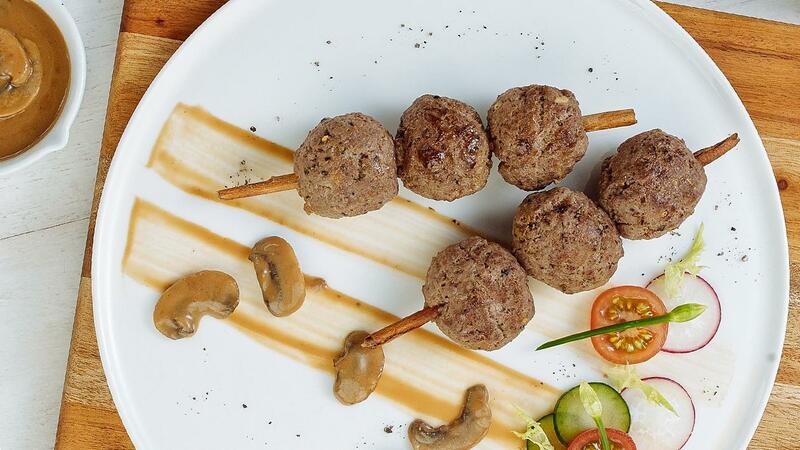 Chef Deden adds the typical Italian-style flavour and processed savoury mushroom sauce, to make the meat balls be a crowd favourite. Prepare a deep enough container, fill in minced meat, with Italian herbs. Add salt and black pepper powder to taste (if necessary). Add chicken eggs, stir again, then add wheat flour/breadcrumb, stir until mixed evenly. Cover this container with a plastic film and store it in the refrigerator for about 30 minutes. Remove from the refrigerator, then make the balls with the size of a ping-pong ball. Heat the pan/griddle flat, add vegetable oil or can also clarified butter, let a little hot, then put one by one meat ball in the heat on the flat pan, each for 2 minutes to one side. Then basting until cooked enough, set aside on cooling wire. In a quite large container, place a demi glace powder, then add warm water/broth, stir until evenly distributed, set aside. Heat sauce pan, add unsalted fresh butter/vegetable oil, let it melt and heat. Put chopped onions and bay leaves, stir until the onions looks yellow. Insert the sliced mushroom, stir-fry and stir until evenly distributed, then add the demi glace mix with the broth slowly, stir to make it not clot, add the broth/water if it feels too thick. Let it slightly boil, add salt and black pepper powder. Before the sauce is lifted and the fire is off, add fresh cream, then stir until evenly distributed, ready to serve the sauces. Fried slices of button mushrooms with medium heat, then drain. Slices cherry tomatoes and red radish thinly. Set aside. Use ingredients that are ready to decorate the dish.